MILITARY TIES: Una Rokoura (right), the sister of army operative, Captain Aseri Rokoura. The sister of one of the military soldiers identified as a QEB Goon is one of the Fiji Netball team officials waiting for a New Zealand visa. 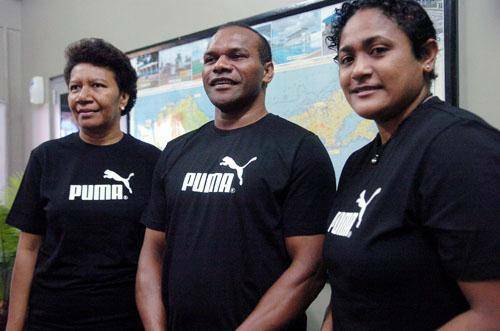 Assistant coach, Una Rokoura, is the sibling of Captain Aseri Rokoura, the soldier who was identified as one of the army operatives behind the brutal assault of Felix Anthony of the Trade Union Congress in February. Una Rokoura's brother is a trusted member of the inner gang of the illegal leader, Frank Bainimarama whose regime has been conducting wide sweeps and arrests recently. Rokoura and others like Major Ben Naliva have been identified as the thugs behind their beatings by citizens who've been assaulted. 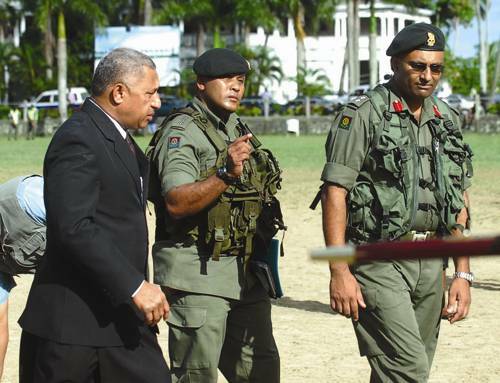 The beatings, of course, have been carried out at the barracks in Suva. The Fiji Netball team is scheduled to fly out on Monday but as of today still didn't have visas. Team officials were expecting to know soon if everyone will be able to travel. Una Rokoura and midcourt Bernie Daurewa both have military connections and could be denied visas by New Zealand who imposed the ban on military and their families because of the 2006 coup. The ban, of course, continues to be controversial and debated with the regime trying to railroad New Zealand and the IRB into allowing Bainimarama and his cohorts to attend the Rugby World Cup in September. The Fiji Netball team will be in New Zealand for at least two weeks and will play the Western Australian team who will also be touring New Zealand. The New Zealand tour is part of the build-up for Fiji Netball's defence of the Pacific Cup in Papua New Guinea in June and the World Championships in Singapore in July. 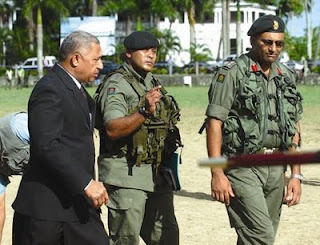 Are the fiji military goons and their families slow learners? You are not wanted - is that clear goons? Go where thugs and dogs are allowed. They should "look North" and go and play with the Chinese Netball Team in order to prepare their defense. While we are there, Bai should organise a Rugby World Cup with China, India and Indonesia. Forget the NZ World Cup. hey guys, whats so special about FELIX ANTHONY BEATING, he is one of those who deserves it. these dogs bark like a bull when they were there. FELIX like his twin suckers DAN URAI and their Mater CHODO all deserve it. Do they realise how much hurt they have inflicted and doen to felloe Indos in Fiji and innocent people who have lost their job due to injustice, liers and greed - to be the saviour of Fiji's economy. Seri - pls lock them up in naboro instead. FELIX & DAN still have to answer to the FNPF fraud, where they paid themselves as directors huge salaries. More then what the previous CEO whom they sacked was being paid after over 35 years of loyal service and building that Fund from hundreds of mi\llions to billions. Please someone in Fiji, contact the N.Z. authorities and make sure that this person is not allowed through ! It's much more effective if the request is backed up by a Fijian ! We do NOT and will NEVER condone evil act of brutality against our fellowmen/women. Perpetrators, civilian or the few thugs in our proud Military Forces will be brought to justice…don’t you worry about that!! BUT, keep innocent family members far away from any from any form of association after the fact or allegations of brutality. She will get her visa as the Kiwi has abundance of common sense and goodwill, and surely approval of any sorting visa definitely is no support for those acts of brutality. Let’s just all chill. Give the family a break guys. I'd say let Bernie and Una go, they deserve to travel with the team. She wont get it, it's more wishful thinking then anything else, probably just thinking that she may just slip through the cracks, Mr Meo you deluded if you think she will get visa. Semi you are just like your puppy mate jake. Can't you understand simple English Semi? The NZ WILL not grant a visa to military personnel and THOSE ASSOCIATED WITH THEM. Geez you are one thick and illiterate person Semi. any thoughts as to what will happen to Mahendra Reddy and his team BOBBY DONT KNOW ANYTHING MAHARAJ after this govt. Can they be charged,any legal eagle reading this. Screw being tightened on military personnel and close relatives with definitely add pressure on the military. Suffering relatives will wail, cry and get sad....surely suffering relative groups around military personnel will just bring home to the affected and especially military personnel the evils they are imposing on Fiji. Go on Aussie and Kiwis, tighten your screws on military and their close relatives. We Fijians fully support the visa ban. @ Semi.....unfortunately S.Meo you have not had the experience of applying for a NZ visa. Their is a separate questionnaire which all applicants have to fill. It identifies those who have immediate family members actively serving in the RFMF (Thug force)...If there are a few too many YES, then expect a NO!! Happy Easter!!! @ "A-NUNI-MOSI" Anonymous April 20, 2011 12:51 PM..oh faceless & nameless coward. @Tui Viti, Sir..watch my lips..NZ will open her borders to Fijians soon...now..got that...vinaka. I have used email facility at above link to Minister of Immigration NZ, and pleaded with him to ban the 2 women in above article from setting foot on NZ, because they are miliary men relatives. Hope many Fijians in Fiji also do the same, contact Coleman the Immigration Minister to ban the 2 women and others related to the military. Those of you needing help in sending emails to Coleman, may check me out at computer shop near RB Patel Nausori mid-day tomorrow. Am just worried, secret agents may pounce on perceived suspects at Nausori computer shop. But I will hang around at stretagic points with camera to photograph suspicious looking goons that may be wanting to interefere with freedom of speech/communication, then publish fotos on blogs if their excursions end up against people. Anyone want to play ball with Meo? Semi Meo can play with his own ball, yes one ball hehehe Semi ulukau. NZ will not change it's stance Semi Ulukau unless Bocimarama adheres to conditions imposed. Meow back if you have something constructive to say boci. @Polo..eh..I meant..let the Netball and the comming Rugby players and spectators travel rights. @ Semi Meo.......NZ has opened its doors to ordinary, peace loving Fijians...not the thugs and their kins.......after all they do realise that the apple does not fall far from the tree........keep the petitions going folks, show this criminals that they can't have everything their way!! Una Rokoura..I am still free if you want to come over permanently to nz. Meo lao ga mai i na farm nei Jake drau lai masi volo ni pulumakau tu kina. Who would have thought, that within 4 years, Fijians would be turning on Fijians as they now do ? @Au Lao.. if y're a woman then she will probably consider you - miss rokoura is gay! Great combo we have in the coaching two. Meo levu a polo no one wants to play with you. It menas you either play wid yourself or go play wid your hero Naivalurua. The very treasonous act of Bainivore turning on Fijians, murdering them, torturing them, stripping off them their human right to congregate, meet in groups, stealing their money to pay himself etc have triggerred this turning of Fijians on Fijians. Wow! Meo is a polo levu? woohoo....!! Good to know the man still has it, you go guy!! Captain Rokoura, continue doing what you are good at and that is torturing people where it really hurts. Do not slow down my friend. Make use of all the tax payers money with the way you and alkie incuding Meo and others enoys better. Laivi keimami na dravudravua me keimami vakadravuadravuataki sara ka tagi vakaidian sara ni sa mosi mai na veika ni vakayacora tiko veikeimami. When that is all done then beware of the payback by our children when you and friends alike grown old and see whether you still can hold that gun upright and handle it with lightining speed like your present strength as of today. Do not forget that there are many ways to sking you and your boss. One of them is to call DAKUWAQA, ROVAROVA, LETUMOMO, DAUCINA and MORO me rau vutuka na nomu sona and many more of our ancestors god to take care of you. Vakacava 'ya Rokoura, PM Voreqe and alike including Meo? hahahahahaha! The Bible has prophesied that this is the end time when vakadraunikau kei na qaravi tevoro ena bulabula cake mai. You know what ? Just because to get rid of you all these will truelly happen with all those bastards in your killing squad and the PM Voreqe. @ Every nameless cowards above...phew...now we have a peek deeper into the souls of most of the bloggers above. We are sad and, not surprised at all, for their own children are bound to learn a lot of gutter language filthy demeanor from these nameless and faceless cowards.Oh..we cry for their children and soon their own wives may see you their insecurity and may, God forbid, look else where. These self inflicted curse may only be nullify should concerted and intentional and individual efforts to wash mouth and clean heart are made. These are the shameful few who claim to be true Fiji patriots, but admittedly have no credible contribution towards our rebuilding process to election in 2014. Oh how we cry for this lost souls while we the 99.99% of Fiji moves on..help and cleanse them Oh God!! NZ will liberally open her borders to ALL Fijian...SOON!!!!! Amalaini Legge has no credibility amongs Fijians in NZ. She is a well known crook with a string of fraud/police cases against her name. She defrauded Govt through the Pre-school funding she managed once and computer grants for communities through the Waitakere City Council to name a few. She was booted out recently by a prominent Auck secondary school when she refused to provide police clearance for a job lined up for her.....by the way she applied to the school for a job as Ema rather than Amalaini....she wanted to distance herself from her past......her friend Bainivore will follow her footsteps by wishing his past does not follow him when he appears in courtsoon. She is well known Bainivore supporter, adding to her unpopularity in NZ. Semi Meo, where did you get your: "NZ will liberally open her borders to ALL Fijian...SOON!!!!!" from?? @Holley..oh the BeeHive in Wellington has more "Queen Bees" to make those humane executive decisions, not the sole prerogative and decision of your neighbor the Foreign Minister. Of course, as Foreign Minister he may have already briefed other Bees within the Beehive of Fiji flirtation with some Mongolian powers, Spaniard Inventors and Oil Rich guru investors in certain Middle-eastern sovereign and families. Do we really think that NZ would not consider; given these swarming prickly issue very close to the BeeHive? ?...Think again!..again we say”"NZ will liberally open her borders to ALL Fijian...SOON!!!!!" @ Semi Meo Your Queen Bee exposition exposes your deficiencies to grasp issues, propensities to lie, rich imagination and dogged determination to stick to your pre-determined worker bee role of collecting pollen. Perhaps you are on grass. @Holley..madam, you are now digging a bottomless hole to nothingness with your glorifies reply..phew!1..some people are still "holley" blind! !..I rest my case and help prepare for to hogi our people we wish entering NZ..SOON!!! @Semi Meo..Meo, go on sit naked bare bottom on a busy buzzing angry Bee Hive while you hongi the i cici of a bare bottom diorrhea sufferer...so you get it from both ends. This may drive some sence into your thick empty brain. Are you some myopic, dead beat cow molester??? @ Rangi ..my good lady....madam, we are shocked by your very graphical commentary of your personal experiences, now you cajole us to follow..sorry, no takers!! Oh..by the way, Col Leweni exemplary service in the 2 PS civil service posts has set a bench mark for his 2 civilian successors. That achieved, he has returned to barracks as should all other Military personal in the Civil Services who successfully achieved the transitions. Give them time, and by 2014 all will be sweet for elections. ...a feeble nobody in Fiji vying for IG posting? ?..that must be the joke of 2011.!! OK..I’ll accept your pseudonymic goose stepping. I assume therefore you’re a I Taukei gentlemen of the 4th confederacy (Yasayasa vaka ra). The battle to return to democratic rule is for all us Fiji Citizens on earth..nearly a million of us all. I do not want to list the little I have done for Fiji since 2006 nor the number of times I’ve visited Fiji since. I bet none of your family members knows about your blogging craze, and none have read the abuses thrown at you....which you deserve. Your family will be thoroughly ashamed of you. What on earth you do everyday for a living??? You spend all your time blogging. @ Manasa...pls keep your artistic prowess of the southside to yourself..thank you!! Gonei..I'm a over 50yrs old man...meu sa rivote tiko ga vei Na kei Na niu bera ni cici e valeni vo?..o vela!! Sir, sa ra bini tu qo na iPad,Bberry kei na kena veimataqali, rawa ni o draiva tiko ga se toka ena nomu kona qai blog toko mai..
What I do for a living? ?..well, email mail semimeo@gmail.com me daru qai veitalanoa vinaka na wekaqu.. So does anyone know what happened to the two women with military connections, did they get a visa or not? Manasa of Waikato - If you know everything about me - why dont you show me the evidence of your accusations and allegations - you have no idea what you are talking about and I do not know who you are. I never defrauded anybody- you have no idea at all- bring the evidence and meet with me and my family personally. Kakua ni da dau vosataka e dua na tamata mai na veika ga e da rogoca. Vakasamataka vinaka na cava mada o vakacacana tiko kina e dua na tamata. Get your facts right.I have the right to support anybody I like that is my personal choice and you cannot tell me not to. Manasa of Waikato - My family and extended families now living in NZ would like to meet with you - We will come to you in the Waikato to confirm your accusations and allegations - I have been told by a reliable source that they know who you are and where you live but I would like you to ring me or one of my boys you are damaging and set a time and place to meet. My family are still very much involved in government here in NZ and we have assigned our family lawyer to look into this allegation by you. You have already been identified.